The App Store is home to many great storybook apps. Over the course of several months, both Eric and I have found and reviewed some of our favorites. Today, I am adding one more book to that list. The app maintains the look and feel of a physical board book. 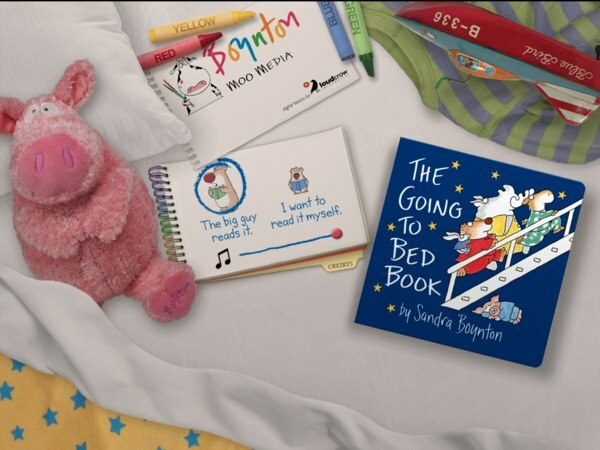 The Going to Bed Book is an interactive app that was adapted from a children's book by Sandra Boynton , famous for its whimsical plot, funny rhymes and cute animal illustrations. The iOS adaption takes all these winning elements and adds fun interactions into the mix, creating a unique app that entices the readers. Upon opening the app for the first time, you will notice that The Going to Bed Book app is made to look like a traditional board book, sitting on a bed. To navigate through the pages, you flip them using your fingers, just like a real book. Your junior can choose to have the story read to them by "the Big Guy" (voiced by popular British singer Billy J. Kramer) or they can read it by themselves. The Going to Bed Book follows a group of adorable animal passengers aboard an ark (which can rock back and forth with the movements of your device) as they prepare for bed after the sun sets. They bounce below deck, where they take a (user-generated) bubble bath in one big tub. Then, they hang their towels to dry and put on their pajamas. Next, they stand together in a crowd (some above, some below) to brush their teeth. This scene in particular has a very neat effect where your juniors can tap on on the hot water tap and watch as the screen slowly fogs up like a bathroom mirror. To clear up the steam, you wipe the screen with your fingers or just turn off the tap. Once the animals are done brushing their teeth, they go up the deck once more to (curiously) exercise for a bit, which you trigger by spinning the moon around. Afterwards, it is finally time to turn off the lights and tuck into bed. Meanwhile, outside the ark, the night sky is calm and clear - until you tap on it to reveal tiny golden stars. The app is littered with interactive elements in every page - an example is this user-generated bubble bath. The Going to Bed Book is a lovely little app which adapts a classic board book into the digital format. Instead of simply transferring narration onto the screen, the developers added plenty of fun interactions to enhance the reading experience. Many elements in the app are interactive - simply tap, swipe, smudge or tilt the device to trigger quirky animations. In both reading modes, your junior can tap on each word on the page to have it read out. It is also possible to repeat the narration for each page by tapping on the small refresh icon at the end of every verse. It is worth noting that the narration style is unlike many storybook apps that I've tried; it is very subdued and calm, which may not be the preference of some parents. Personally, I don't think this is a bad thing (in fact, I think it suits the "going-to-bed" vibe of the story), but you may want to listen to it first to see if it suits you. In this scene, your junior can turn on the hot water tap and the screen will fog up like a bathroom mirror. You can wipe away the steam by smudging on the screen. As a person who has great appreciation for whimsical stories, I really love The Going to Bed Book. The story is silly and innocent - which child does not enjoy reading about cute animals who wear pants and live on an ark? Exactly. I think the developers - the same people who made PopOut! The Tale of Peter Rabbit - did a really great job by incorporating many interactive elements throughout the app to create a delightful and inventive reading experience. A favorite scene of mine is where the animals are running up the stairs to exercise. In this scene, you can use your finger to pull the animal back like a catapult. When released, the animal will instantly leap up the stairs and disappear from view, which I find humorous. Another great scene is at the end of the book, where the ark is shown rocking on the sea with the night sky as its backdrop. Tapping on the sky will cause a tiny star to come into view for several seconds before fading out into the background, and you can tap on many spots to create a bunch of stars. It just feels magical, and creates the perfect closure to a wonderful story. Another thing that I like is the way the developers snuck in helpful hints to point out many of the interactive elements in the app. While the curious readers will easily find all the "hidden" gems, I think it clever how the app puts a "Spin" tag next to the Moon to let you know that you can twirl it to make the animals move. The overall ambiance of the app also contributes to a wonderful reading experience. While some people may not like the soft narration style, I think it suits the story well. The background music is lovely, and will lull you to sleep as soon as the story ends. Oh, and don't forget to listen for subtle sound effects, such as the splashing sound of the water as the ark rocks back and forth or a quiet "good night" when you tap on the moon at the end of the story. In addition to tapping and smudging, you can also tilt the device to manipulate elements in the book, such as to rock the boat. The Going to Bed Book is a lovely story, made even more delightful to read by the addition of merry interactions and soothing sounds. If you have the original book, this app will provide you with a fresh experience. If you don't, then you won't regret getting the app. Get The Going to Bed Book on the App Store.